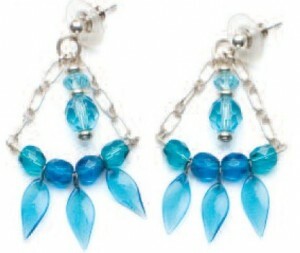 These colorful and quick-to make earrings are surefire compliment catchers. Materials 2 light blue 6mm Czech pressed-glass rondelles 4 dark blue 6mm Czech fire-polished rounds 4 medium blue 6mm Czech fire-polished rounds 2 light blue 8mm Czech fire-polished rounds 6 dark blue 12mm leaves with wire eyes 6 sterling silver 2mm spacers 4″ of sterling silver chain 3″ of 20-gauge sterling silver wire 2 sterling silver head pins 2 sterling silver 6mm jump rings 2 sterling silver earring posts Tools Needle-nose pliers Wire cutters Technique Wireworking Finished Size 13⁄4 × 11⁄4″ Step 1: Form a simple loop at one end of 11⁄2″ of wire. String 1 medium blue 6mm, 1 leaf, 1 dark blue 6mm, 1 leaf, 1 dark blue 6mm, 1 leaf, and 1 medium blue 6mm. Bend the wire into a shallow U-shape. Trim the wire to 1⁄4″ then form a simple loop to secure the beads (Figure 1). Repeat for the second earring. Step 2: Cut four 1″ pieces of chain. Attach one end to each loop by opening, then closing the loops (Figure 2). Step 3: Use a head pin to string 1 spacer, 1 light blue 8mm, 1 spacer, 1 rondelle, and 1 spacer. Trim the pin to 1⁄4″ then form a simple loop. Repeat for the second earring. Step 4: Open the jump ring to string the end of a chain, a head pin from Step 3, the end of the second chain, and an earring post (Figure 3). Close the jump ring. Repeat for the second earring. Alexis Rossi has been making beaded jewelry for nineteen years. You can see more of her work at www.alexisrossijewelry.com.